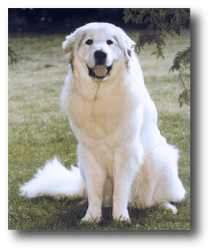 If you have ever met a Great Pyrenees Mountain Dog you will know they are unforgettable! And without a doubt, a Pyr puppy will steal your heart away! 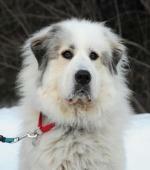 Sometimes referred to as a Great Pyr, this dog’s size is imposing, its movement graceful and its beauty breathtaking. It’s quite common for anyone nearby to stop and ask about this striking dog. This is a big, powerful, willful dog that is unique in many ways. It has special needs that many dog owners or potential dog owners, may not know. 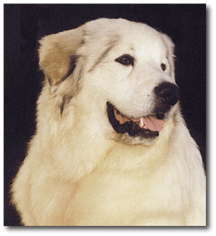 Dedicated to advancing the interests of the breed, the Great Pyrenees Club of Southern Ontario was formed in 1977. Club members work constantly to encourage and maintain the highest standards for the breed. The Club, including this site, is dedicated to assisting breeders, owners and the general public in furthering their knowledge and appreciation of this magnificent dog. “So how do we do this?” you ask. There are many ways. The Club promotes and holds Specialty Shows, Boosters, Sanction Matches, Fun Matches and Obedience Trials. And for more relaxing times, outside of conformation and obedience showing, the Club promotes and encourages social activities with owners and their dogs including picnics, parades and walks. 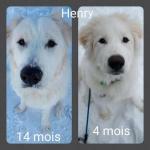 Now, if you think ONE Great Pyr is impressive… imagine seeing a whole pack of them!!! 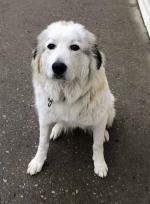 Unfortunately, not all relationships between Great Pyrs and their human companions work out in a way that we would like. Sometimes circumstances change outside of anyone’s control. 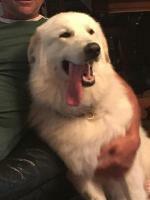 Other times the human realizes that the Great Pyr is bigger and hairier and noisier than was anticipated. For any number of reasons, this beautiful dog can find itself in need of a new, loving home. 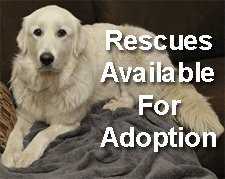 As a result the Club has established and maintains a Great Pyrenees Rescue Sub-committee, dedicated to the rescue of the Breed and placement of rescue dogs with responsible owners, as-well-as fostering such rescue dogs until suitable homes can be arranged. 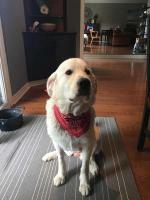 Of course it is our aim to ensure that anyone interested in sharing his or her life with a Great Pyr, is fully informed and fully aware of the unique realities of the breed. 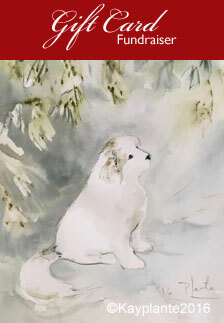 And what geographical area does the Great Pyrenees Club of Southern Ontario represent? Well it’s more than you may have imagined. The area includes Southern Ontario, South Western Ontario as well as Eastern Ontario. Here’s your geography lesson for today… The area served by the Club is all of Ontario below the 46th degree of latitude. The 46th degree of latitude extends from the east at the Quebec border near Chalk River and travels west just north of Manitoulin Island to the United States border. Yes folks, you heard it right here… the Club’s territory extends west to the United States border, east to the Quebec border, north to the 46th degree of latitude and south to the Great Lakes. Okay, the geography lesson is over! So that’s our story. 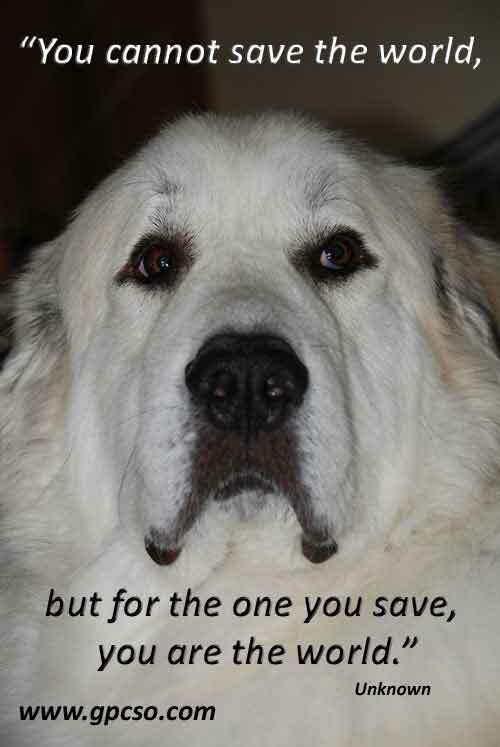 The Great Pyrenees Club of Southern Ontario is here to help advance the interests of the breed by providing you with trusted resources to ensure that you and your Great Pyr have a happy, long life together. Join the club and get involved… or simply stay tuned as our site evolves to provide the best possible access to the club and reliable information about the Breed.